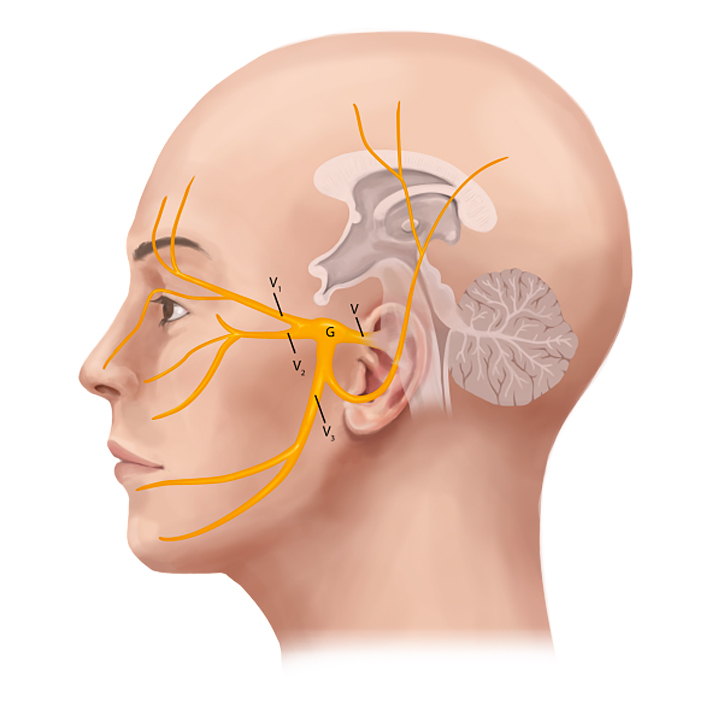 Trigeminal neuralgia (also called tic douloureux) is a condition which causes sharp shooting pain on one side of the face, due to irritation of the Trigeminal (fifth) cranial nerve. The pain is often triggered by common things such as eating, or brushing the teeth but can come on anytime in paroxysmal attacks that are usually extremely painful. The pain attacks can be reduced by the use of medications such as carbamazepine but if this does not control it, then surgery is sometimes recommended. The condition is thought to be caused in many cases by a loop of a blood vessel in the back of the brain which contacts the Trigeminal nerve, and causes it to fire abnormally. The surgical procedure involves a small craniotomy, or skull opening made just behind the ear. Using the operating microscope, the nerve and vessel are identified and then the blood vessel is gently moved away from the nerve. Usually a small piece of teflon sponge is placed between them to cushion the nerve from the pulsations of the artery. This procedure has a very high success rate. A similar operation is performed for patients with hemifacial spasm, which is caused by a very similar problem where a blood vessel touches the facial nerve, which supplies the muscles of the face. For more information, please talk to your surgeon. Get a referral from your doctor before booking an appointment.